The complete stroller that combines style and features. New four-wheel design with 12-ball bearings and suspension allows for a smoother ride and enhanced maneuverability. The Pliko Four is designed to provide comfort for baby and convenience for parents. The Pliko Four is the ultimate, complete stroller. Parents will love how the Pliko Four combines all the best features of a full-sized stroller (multi-position recline, large canopy, Easy Drive system) with the convenience of a lightweight design that offers quick, easy and compact folding. Must be purchased from www.pegperego.com, 3rd party sellers do not qualify. New York City blogger, Jodi Kendall, reveals what she likes best about the Pliko Four. Take a look at the Pliko Four in action, thanks to our friends at MacroBaby! The Pliko Four easily becomes a travel system with a coordinating Primo Viaggio SIP 30-30 or Primo Viaggo 4-35 infant car seat. The car seat attaches directly to the stroller's retractable anchors, offering a simple transition from vehicle to stroller. The Pliko Four is outfitted with premium fabric giving it a fashionable feel, plus maximum comfort. Detailed stitching and piping provides the upholstery with a well-tailored look. Parents can choose from a wide selection of color collections that complement their lifestyle, and their style. Travel System Travel System compatible with the Primo Viaggio SIP 30-30 and Primo Viaggio 4-35. 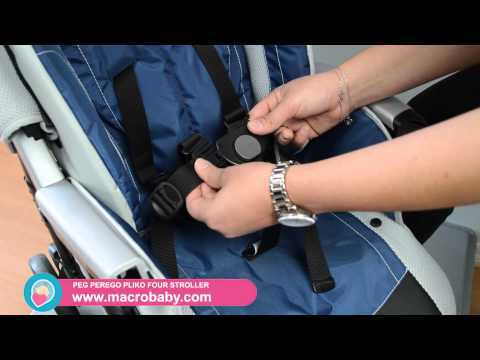 Car seat attaches directly to the stroller's retractable anchors. Easy Close One-hand fold design allows for quick, easy and compact folding. Easy Drive Wheels with ball bearings and suspension allow for 360-degree agility and require less effort in pushing. Telescoping Handles Adjustable, telescoping handles for each parent's height preferences. Recline Four-position recline with two-position footrest. For Two Built-in rear footboard provides a safe ride for a second passenger. Basket Large, handy storage basket holds all the necessities. Large Hood Large hood with window and pocket unzips to become a sun canopy. Fashion Forward Available in a variety of fashionable color collections and materials that will keep child comfortable. Boheme’s woven fabric in a sophisticated burgundy hue is accented by an elegant stormy grey. Using leather piping, trim, and pocket tabs, Boheme is a conservative look with the statement of fashion key colors. Part of Peg Perego Elegance Fabrics. Newmoon’s woven fabric in a moonbeam bronze shade is accented by an elegant timeless black. Using leather piping, trim and pocket tabs, Newmoon offers a striking combination for those stylish outings with your little one. Part of Peg Perego Elegance Fabrics. Southpole features icy grey with black in a nature inspired combination of colors. Accented by textured silver mesh fabric, Southpole is crisp and cool like fresh air. Part of Peg Perego’s Sportive Fabrics.